HONOLULU, HI -- (MARKET WIRE) -- October 31, 2005 -- Kamakura Corporation announced today that its monthly index of troubled companies in the United States rose sharply in October, reversing four months of steady declines in the number of troubled companies. Kamakura's troubled company index reached 13.8% of the public company universe, up from 13.1% in September. 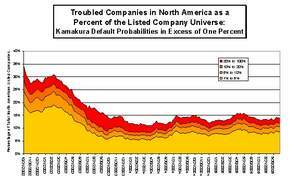 The Kamakura troubled company index reached its low point of 11.1% in April 2004. The index exceeded 30% at the height of the last recession. Kamakura classifies any company with a default probability of more than one percent as troubled. "The bankruptcy of Delphi Corporation, following on the heels of the Delta and Northwest bankruptcies, shows that oil price risk is deeply embedded in some sectors of the public company universe," said Warren Sherman, Kamakura President and Chief Operating Officer. "Toyota has intentionally developed a product line that is effective at any level of oil prices, from the Prius when oil prices are high to the Land Cruiser when oil prices are low. Companies without this natural hedge are feeling the effects of a prolonged rise in oil prices. In October, the number of companies with default probabilities between 1% and 5% jumped sharply to 8.6% of the universe from 7.9% in September. Companies with default probabilities between 5 and 10% were unchanged at 1.9% of the universe from 1.9% a month earlier. Companies with default probabilities between 10% and 20% declined slightly to 1.4% of the universe from 1.5% in September. The riskiest firms in the universe, those with default probabilities over 20%, remained steady at 1.9% of the universe in October." Kamakura Corporation is a leading provider of risk management information, processing and software. Kamakura has been a provider of daily default probabilities and default correlations for listed companies since November, 2002. Kamakura launched its business mortality model for unlisted companies in January 2004. Kamakura is also the first company in the world to develop and install a fully integrated credit risk, market risk, asset and liability management, and transfer pricing software system. Kamakura has clients ranging in size from $3 billion in assets to $1.6 trillion in assets. Kamakura's risk management products are currently used in 17 countries, including the United States, Canada, Germany, Switzerland, the United Kingdom, the Middle East, Africa, Australia, Japan, China, Korea and many other countries in Asia.